Saving your tomato seeds is easy and fun. Plus, when you save tomato seeds, you save money. Here’s the dirt: many different kinds of flower and vegetable seeds can be collected, saved, dried, and used next year. But with tomato seeds, you must take one additional step – fermentation. Tomato seeds (along with a few other types of seeds, including cucumber and melon seeds) are enclosed in gel casings. The casings contain growth inhibitors that prevent the seeds from sprouting inside the tomato. In the garden, the casings break down naturally as tomatoes fall to the ground and fruit decays. Fermentation allows you to move that process along manually. To ensure a strong germination rate next spring, when drying tomato seeds make sure you include the extra step of fermentation. Save seeds from “open pollinated” (OP) or heirloom tomatoes. These are tomato varieties are true to their type from their own seed, which means the next season’s plants maintain the same characteristics as they previous one. Hybrid tomatoes, on the other hand, are bred from two parents of different varieties. Because of that, it’s questionable whether or not they produce seeds that keep their characteristics from season to season. Select your tastiest and healthiest heirloom (OP) tomatoes from which to save seeds. Saving tomato seeds: which varieties should you save for next year? 1. Wash tomatoes from which you will save seeds. 3. With a spoon or your finger, scoop out seeds. Place them in a bowl, cup or jar. Reserve the remaining tomato to eat fresh or use to make salsa. 4. Add enough water to the tomato seeds and pulp (depending on the juiciness of the tomato) to make a soupy consistency. Stir the mixture to loosen the pulp from the seeds. 5. Cover the container with plastic wrap (punch holes in wrap so air can move) or cheesecloth. If using a jar, punch holes in the lid or don’t screw it on too tightly. Air circulation helps fermentation. Fermentation causes air to expand. A tightly-fitted lid on seeds could make the container explode during fermentation. 6. Label the container with the name of the tomato variety. Don’t trust your memory! 7. Set the container in a warm, protected area, such as on top of the refrigerator or dehumidifier. The ideal temperature for fermenting seeds is 70º-80º F. Try to avoid drafty areas. If your house is cool, or you can’t find a warm area, seeds will still ferment but the process may take a day or two longer. The key to this step is careful observation. Watch closely to note when fermentation begins. 1. Each day, remove the covering from the container. Stir the seed liquid. Replace the cover. Set the container back in its warm area. Repeat for 2-7 days (on average 4-5 days), depending on the temperature of your house and the area in which seeds are placed to ferment. a white, foamy mold will form on the top. The mold is harmless to the seeds. In cooler temperatures, mold may not form. Fermentation helps dissolve the gel casings around the seeds. 3. Remove seeds from the liquid as soon as fermentation begins. If you allow seeds to stay in the liquid as it ferments, they may begin to sprout. Warm, wet conditions in the jar are perfect for sprouting seeds – a development you want to avoid when saving seeds. There are three purposes to rinsing: you want to stop the fermentation process, separate the pulp from the seeds, and separate the good seed from the bad. Take these steps to properly rinse tomato seeds. 1. Remove foamy mold from top of container. 2. Rinse seeds. Add water to fill the container. Stir the mixture several times and then wait about 10 seconds. Good seeds will sink to the bottom of the container; bad seeds will float to the top. Pour off the liquid and bad seeds. 3. Repeat the rinsing process as many times as you need until all pulp, mold, and debris is rinsed from the seeds, all remaining seeds have settled to the bottom of the cup, the water is clear, and no seeds float to the top of the cup. It’s important to continue to rinse the seeds in the container in order to separate out bad seeds as they float to the top. 4. When seeds are thoroughly rinsed and sorted in the container, pour them into a thin-gauged wire mesh sieve to wick out remaining water. After rinsing, monitor seeds carefully to make sure they dry thoroughly before you store them. Here's how. 1. Stir and dry: spread rinsed seeds in a single layer on a paper plate, glass dish, mesh screen placed over a plate, parchment paper, waxed paper, or coffee filter to prevent sticking. Avoid drying seeds on ceramic, metal, or plastic, which don’t breathe and don’t allow water to wick away from seeds. Label each tomato variety. You can also save tomato seeds on paper towel to save time and produce your own seed tape. 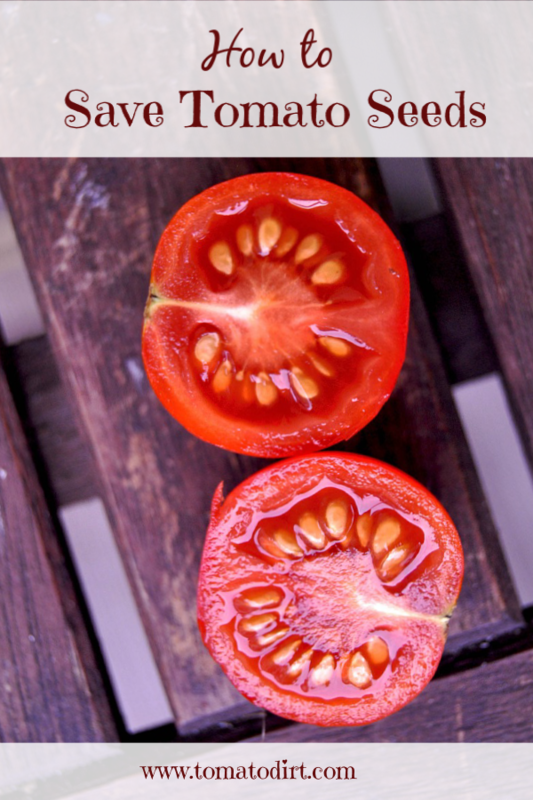 Find out how to make your own tomato seed tape. 2. Set seeds in a warm area to dry, away from direct sunlight. The top of a refrigerator works well. 3. Shake plate or stir seeds daily to prevent clumping and allow even drying. Spread seeds in a single layer after stirring. When seeds are exposed to air, they dry quicker. 4. Seeds will dry in 1-2 weeks. 5. Seeds have difficulty drying in high humidity and high temperatures. If exposed to those conditions during the drying process, wet seeds may sprout. 6. Do not heat seeds as they dry. Never place them in an oven. 1. Store dry seeds in either paper envelopes or zipped plastic bags. 2. Make sure seeds are 100% dry before storing them, especially if using plastic bags. Otherwise, extra moisture will be locked into plastic bags and spread to all seeds, allowing mildew and rot to spread and ruin the whole batch. 3. Add silica gel packets to saved seed bags as an additional moisture deterrent and to increase shelf life. 4. Label seeds with variety and date. 5. Store seeds in a cool, dry place. Many gardeners store tomato seeds in the refrigerator or freezer. How do I know when my tomato seeds are completely dried? 2. Dried seeds will be very hard. 3. Dried seeds are difficult to bite or smash. 4. An adequately dried seed makes a faint snapping noise when broken in half. 5. Seeds that bend rather than snap need to be dried longer.